From Figure 2: Conditioned media from MIO-M1 cells exposed to 1% O2 hypoxia 48 hours (H) stimulated HRMECs tube formation compared to 20% O2 normoxic condition (N) (n=12 per group). The total length of tubes decreased by pretreatment with digoxin (H+D). 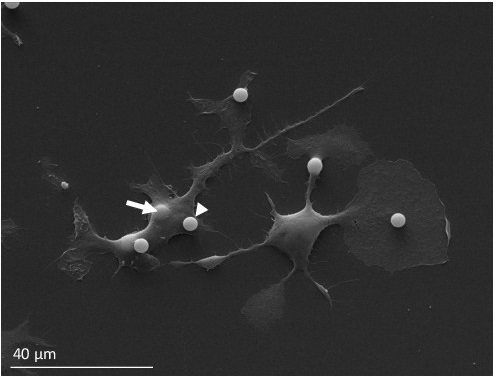 From Figure 8: Representative image of primary microglial cells showing attached (one example is shown with an arrow) as well as engulfed (one example is shown with an arrowhead) microspheres. 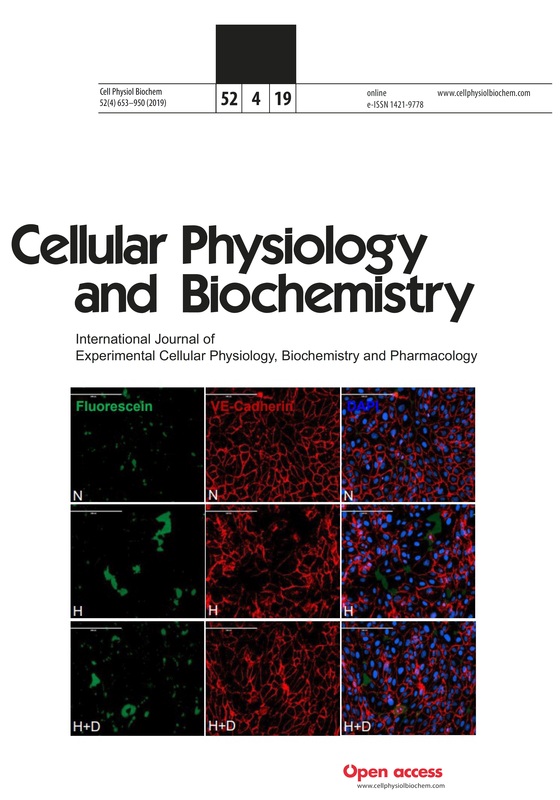 With great excitement I am very happy to serve as Editor in Chief for Cellular Physiology and Biochemistry, a leading journal disseminating scientific knowledge on cellular, molecular and biomedical functions and dysfunctions since 28 years. I am looking forward to serve the community with scientifically outstanding manuscripts reporting novel discoveries in this fundamental area of medical research. We welcome authors from all parts of the world to consider the journal as the prime platform of their experimental data and scientific communications. With careful, fast and fair peer review we shall secure highest scientific standards of published papers. Please note that at present Clarivate does not list the journal in web of science with the result that they will not publish an impact factor in 2019. The current impact factor is 5.5. Cellular Physiology and Biochemistry is a multidisciplinary scientific forum dedicated to advancing the frontiers of basic cellular research. It addresses scientists from both the physiological and biochemical disciplines as well as related fields such as genetics, molecular biology, pathophysiology, pathobiochemistry and cellular toxicology & pharmacology. Original papers and reviews on the mechanisms of intracellular transmission, cellular metabolism, cell growth, differentiation and death, ion channels and carriers, and the maintenance, regulation and disturbances of cell volume are presented. Appearing monthly under peer review, Cellular Physiology and Biochemistry takes an active role in the concerted international effort to unravel the mechanisms of cellular function. Cell Physiol Biochem publishes at least 6 issues per year.